Telemedicine, telehealth, virtual care, teleradiology, telepsych – some of these terms we’ve been learning about for years, others are newer. And if the researchers at International Data Corporation (IDC) are right, we’ll all experience them ourselves, as patients, for years to come. IDC recently released its healthcare IT predictions for 2016, and among them is a prediction that virtual care will become routine by 2018. 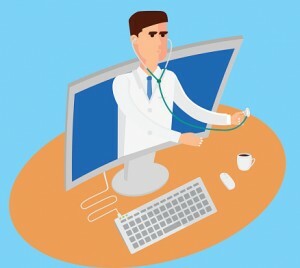 Virtual care is defined as the ability to connect with physicians on an anytime, anywhere basis, such as a video visit with your doctor. The expanding Internet of Things (IoT) and big data, combined with advances in information technology, video technology and medical devices, including wearables, practically guarantee that we’ll all be “telepatients” at some point in the future, engaging in video calls with our healthcare providers on a regular basis. The day when we’re FaceTiming our primary care physician or our child’s pediatrician is just around the corner, if it’s not here already. According to the American Telemedicine Association (ATA), nearly 15 million patients used telehealth services in 2015, a 50 percent increase from 2013. Insurers, the ATA states, are adopting virtual care a rapid rate because it avoids unnecessary trips to the doctor and provides better access to those who need it, when they need it. This includes more than 50 million Americans who live in rural regions, patients who need access to key medical specialists, or parents worried about a sick child in the middle of the night. The benefits of telemedicine and virtual care were supported by a recent survey conducted by the University of Missouri School of Medicine. The survey reported that more than 80 percent of patients and providers were satisfied with the quality of care. For Carestream, the trend in virtual care paves the way for increased teleradiology needs. The video case study on Innovative Radiology shows how the organization successfully provides 250,000-300,000 readings per year using teleradiology. UnityPoint Health – St. Luke’s in Sioux City, IA, launched its Virtual Care service last June. CEO Lynn Wold told the Sioux City Journal that the service is aimed at patients with relatively minor health issues, such as ear infections, cold and flu, rashes, allergies and urinary tract infections, just to name a few. For $49, a patient can be diagnosed by a physician using a computer or smartphone and get a prescription, if needed. “That’s something that’s very relevant and will continue to grow,” Wold said. The post CIO Perspective: IDC Predicts Virtual Care Will Become Routine by 2018 appeared first on Everything Rad.